Order will help stage your closets and storage to ensure that when your house goes on the market it looks like it is right out of a magazine. We work with you and your furniture stager to determine which items should stay in the staging and which items should go into storage until you move into your new home. We staged the closets in this upscale condo in San Francisco. We sorted, labeled and removed items for storage and for the new home. We moved all of the items in the master closet to wooden hangers. The wooden hangers were then used in the new home. We removed all personal items and packed away unnecessary items and clutter that made the closets look messy and took away from the usefulness of them. We staged the small linen closet in this beautiful San Francisco home. We sorted and purged anything that wasn’t a traditional “linen closet” item. We grouped all bedding together -- twin, king, crib, etc. We also grouped different types of towels together. We then labeled the shelves, so that the linens would return to their correct home when they were put away. 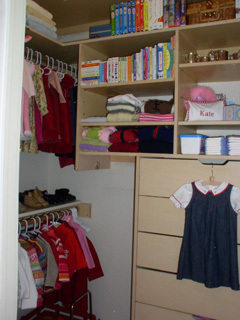 In staging this spacious child’s closet we used everything the client had in the closet and just made it look nicer. 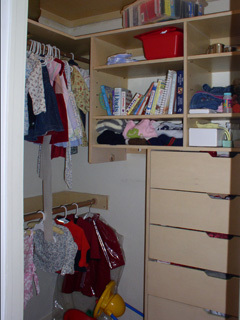 We organized like things together, purchased appealing hangers that were appropriate for a child, we displayed a cute dress so that it was apparent the room was meant for a couple with a young child. We thinned out the contents of the teenagers’ room and carefully packed it for storage until the new house was ready. We were able to use the existing stuff on the shelves to stage this room as opposed to having to bring additional items into the room. We staged the closet shelves in this Mill Valley master bedroom by reorganizing and displaying like items together. We added more shelving so that all the shoes were in shoe racks and sweaters were folded and organized by color. We switched out all hangers to beautiful Cherry wood hangers so that all items looked consistent.